The McPin Foundation champions the inclusion of people with lived experience of mental health problems in mental health research, often called Public & Patient Involvement in research or PPI. In our public involvement and research work we often seek to test new methods of doing this. Because this is a relatively new field researchers, let alone the wider public, have yet to come to a consensus on the most appropriate terminology to describe it. 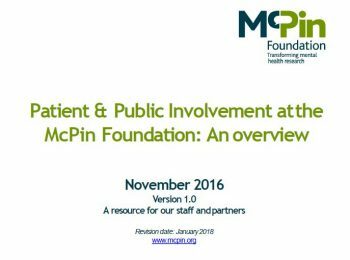 We have therefore produced these slides as an overview of the language we use at McPin and how we work. They are mainly intended as a guide for our staff, so we are consistent in how we speak, and our collaborators so they are clear about what we mean. They may be of use to other researchers who are thinking about similar issues. Our Research Director and Co-Founder Vanessa Pinfold blogged about the process of creating these slides.